A while back I built a pair of sound-reactive LED towers which were on display a few times, at some local Chicago events. 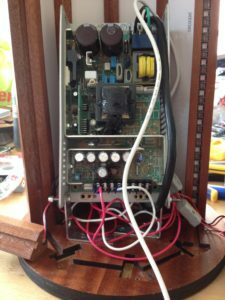 To plug into the DJ mixer output required a relatively expensive device to get the stereo signals (with external gain control) seen by a computer running processing.org as a microphone input. Also, it was a relatively bulky affair to have yet another laptop sitting next to the mixer when the artist wasn’t using it to make the music. Recently I discovered that starting with the 3.1 release, Processing can now run on a Raspberry Pi and has built-in ability to manipulate the GPIO ports. This blog entry highlights the release. This is exciting news as now the laptop can be replaced by a Pi 3 with a small touchscreen. Here is a video of the light towers in action. 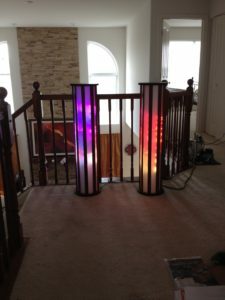 The towers each have 8 panels with 60 individually addressable RGB LEDs. These pictures show off more of the visual esthetic and the cutaway view reveals something of the construction. The LED strips are hidden in a channel in the wood supports which side illuminate acrylic panels (backed with just a strip of white cardboard). The acrylic is impregnated with a diffuser which reflects the edge-lit light 90 degrees to exit out of the faces of the panels. The white cardboard reflects the 1/2 of the light that would otherwise be directed inwards. The acrylic is produced by Evonik and is called Acrylite EndLighten. The towers themselves only require 110 VAC power. The data frames to control the LED strips are sent wirelessly from the processing script using an Open Pixel Control module which maps points on the processing screen into frames sent to a Fadecandy server running inside a OpenWRT Wifi device which is then physically connected to a Fadecandy board. I used TP-Link TL-MR3040 WiFi devices to run OpenWRT and added the Fadecandy server application into the img file used to reflash the WiFi devices. The Fadecandy GIT repository can be found here. This is the assembled Raspberry Pi 3 w/ 2.8″ TFT Capacitive Touchscreen mirroring the HDMI frame buffer in a Zebra case without the top cover. There were a lot of possible paths to follow in getting this build working the way I wanted it to be. Most of my Google searching turned up outdated examples, particularly due to the changes introduced in the 4.4 kernel with /boot/config.txt use of overlays. 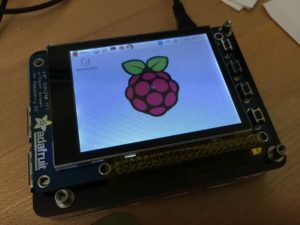 Adafruit had this very nice looking tutorial of how to get the touchscreen working with their version of the Jassie Raspbian os image. The inclusion of how to use FBCP was of particular interest as mirroring the HDMI output is important for displaying processing scripts with the 2D or 3D graphics libraries. Their Raspbian image was based on an older kernel and updating the os (sudo apt-get update; sudo apt-get dist-upgrade) turned out not to just work. Download the latest Raspbian Jessie image here. Extract the .img file using “The Unarchiver.app” as opposed to the built-in “Archive Utility.app” as I saw many comments that the default app caused issues. I chose a 32GB Samsung EVO Plus (model MB-MC32D) micro SD. It has a red background. Insert the SD card into the Pi and hook it up to an HDMI monitor. You will need a keyboard and mouse as well. The touchscreen should now display the 640×480 desktop scaled down to the 320×240 PiTFT screen. This makes things look less crisp but has the advantage that connecting to an external HDMI display will work and that most apps need the larger dimensions be usable. Note that many HDMI displays will not be able to handle a 320×240 HDMI signal. The version of the 2.8″ PiTFT I got from Adafruit, comes with 4 buttons and I created this test Python script to demonstrate not only how to use the RPi.GPIO library, but how to manipulate the PiTFT backlight (so as to not burn-in the screen), use multi-threaded event handlers, and shutdown the os to safely disconnect the power. I created this script as: /home/pi/pitft_buttons.py (chmod +c pitft_buttons.py to make it executable) and test by typing ./pitft_buttons.py. Note that pressing the bottom right button (#27) will ask for authentication for powering off the Pi. See below to set this script running as a service, in which case, the user will not be asked for authentication. print "Button #22 toggles the TFT backlight." print "Button #23 displayed the time the button is pressed." print "!!! Pressing button #27 for at least 2 seconds, powers down the Pi !!!" Run a processing sketch from a script or from a terminal window or ssh session.